Pyrisitia chamberlaini male ups New Providence Isl. Bahamas July 1980 D.S.Spence. Specimen from the collection of the Oxford University Museum of Natural History. 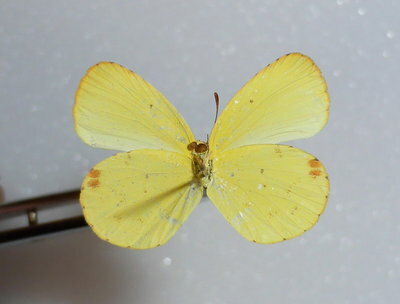 Description and Similar Species: Wingspan 25-35mm. Sexually dimorphic. Males are usually orange on the upperside, brighter than Bush Sulphur Pyrisitia dina, with a variable black border to the forewing. Males are very variable in size, colour and the extent of the black border. Females are small and yellow or yellow-orange- in colour. 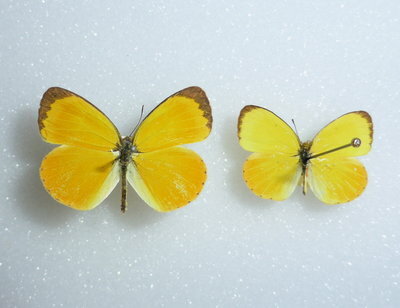 The bright colour combined with its small size, on average slightly smaller than Little Yellow Pyrisitia lisa, is diagnostic. 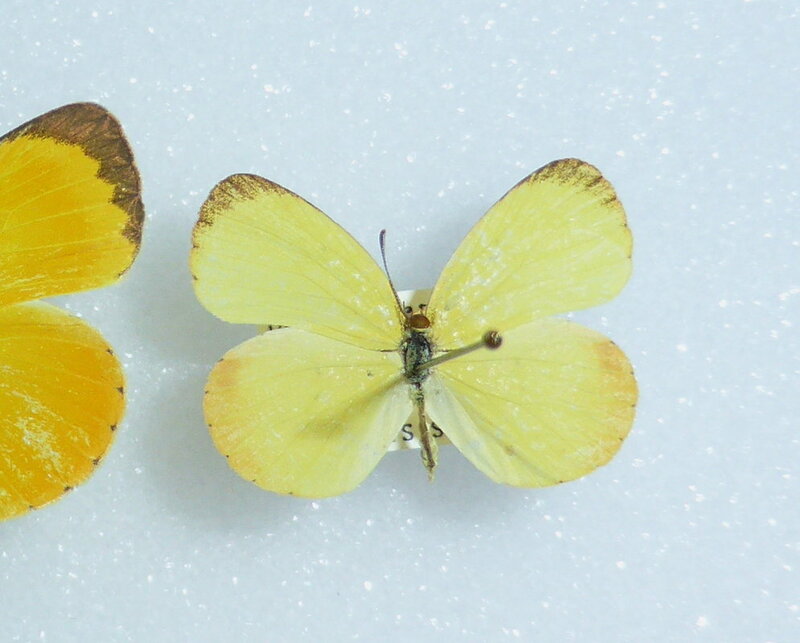 The underwings resemble those of Bush Sulphur Pyrisitia dina but lack the the dark markings near the forewing tip. Etymology: Pyrisitia chamberlaini is named after the British Prime Minister Neville Chamberlain who was born in Birmingham on 18 March 1869 and became keen on natural history. At the age of 21 he was sent by his father to the Bahamas to establish a sisal plantation that his father thought would revive the family fortunes. The plantation, established the following year on North Andros Island, failed in 1896 and he returned home. 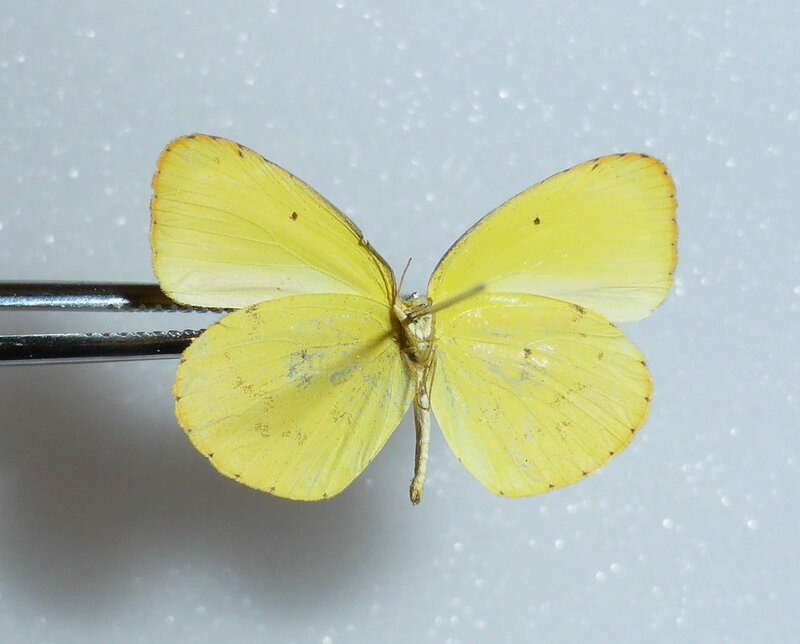 While there he had collected many butterflies and other insects and in 1898, Butler described a new Eurema endemic to the Bahamas and named it after its collector Neville Chamberlain. 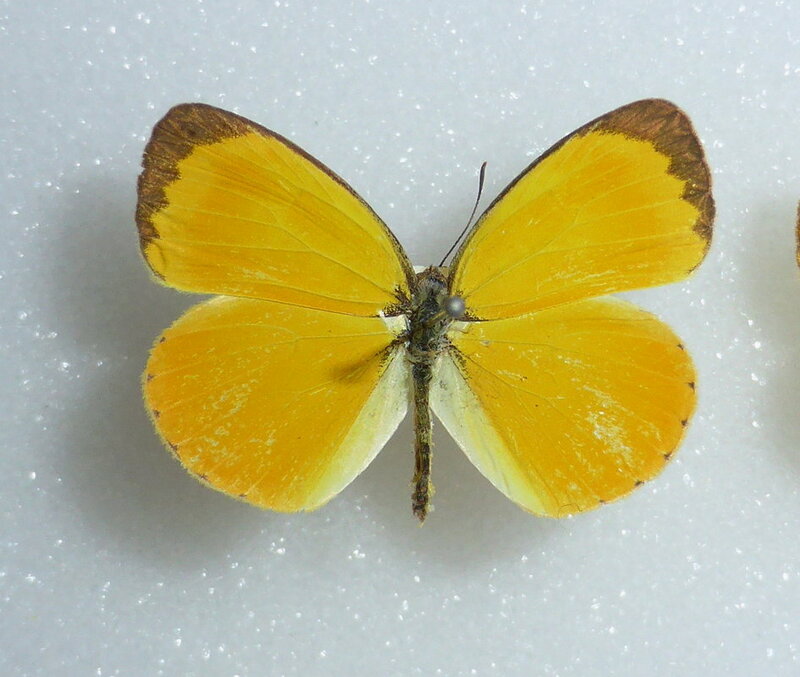 The species has subsequently been reassigned to a different genus and is called Pyrisitia chamberlaini. On his return to England Neville Chamberlain entered politics and went on to become the Chancellor of the Exchequer and then Prime Minister from 1937-1940. Range: Known only from various islands in the Bahamas where four subspecies have been described. It is thought that the Cuban specimens most closely resemble the subspecies mariguanae. 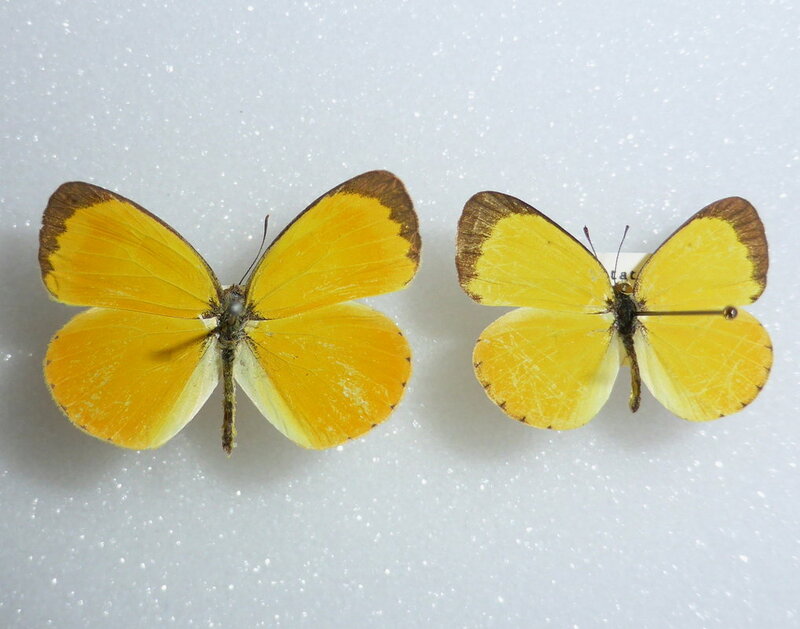 Note that the specimens depicted are all of the subspecies E. c. chamberlaini. Status: Very rare in Cuba and has been seen only once when 10 were taken near the Rio Toa 4km west of Baracoa, Guantánamo province in August 1995 (Hernández, Miller, Miller, Simon & Turner, 1998). It should be noted that Inagua Island lies only about 110km to the NE of Baracoa. Nectar Plants: Unknown in Cuba. Larval Foodplants: Unknown in Cuba. Pyrisitia chamberlaini males ups New Providence Isl. Bahamas July 1980 (left), 4 Mar 1979 (right) D.S.Spence. Specimen from the collection of the Oxford University Museum of Natural History. Pyrisitia chamberlaini males ups New Providence Isl. Bahamas July 1980 (left), 21 Aug 1979 (right) D.S.Spence. Specimen from the collection of the Oxford University Museum of Natural History. Pyrisitia chamberlaini male uns New Providence Isl. Bahamas July 1980 D.S.Spence. Specimen from the collection of the Oxford University Museum of Natural History. Pyrisitia chamberlaini female ups New Providence Isl. Bahamas 21 Aug 1979 D.S.Spence. Specimen from the collection of the Oxford University Museum of Natural History. Pyrisitia chamberlaini female uns New Providence Isl. Bahamas 21 Aug 1979 D.S.Spence. Specimen from the collection of the Oxford University Museum of Natural History.